Still a youngster. It took the better part of an hour for it to begin to reveal its character. Beguilingly attractive nose, more fruit dominant character than toast/biscuit/leesy character. Flavors are influenced at first by a slightly bitter (fruit pit) and saline mineral profile, which calms down over the course of a couple of hours. Gradually, tropical fruit comes front and center, with notes of orange and hazelnut. An impressively precise cut informs the palate. The Les Crayères pedigree is fully showcased. Quite a bit less developed than the Egly-Ouriet VP (disgorged May 2007) that we had last year. 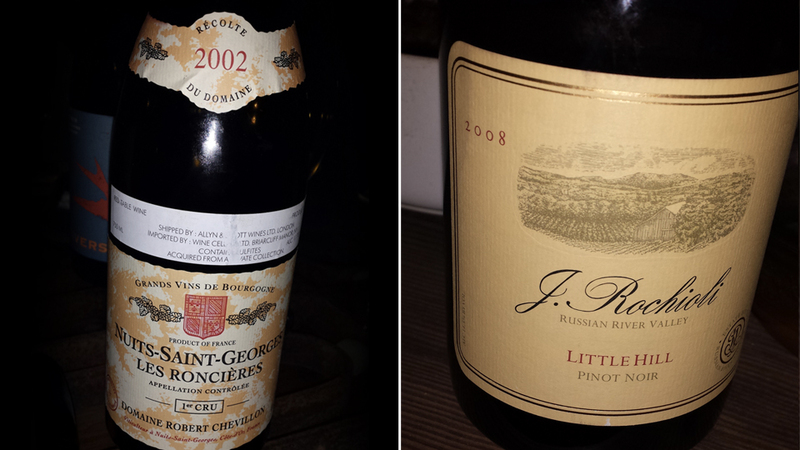 These are long-lived wines. Taught and wiry upon opening. Double decanted back into clean bottle (although not really necessary from a sediment perspective... just needed aeration). It took several hours for this to unwind. But once it did, there was a nice high-toned, cherry influenced fruit profile with subtle minerality. (Although quite reticent nose). Sweet caressing texture of mellowed tannins that is very welcoming. Not manifesting a lot of sous bois or earthy elements at this stage. Give this lots of air. A nice counter-point to the Rochioli Pinot Noirs. 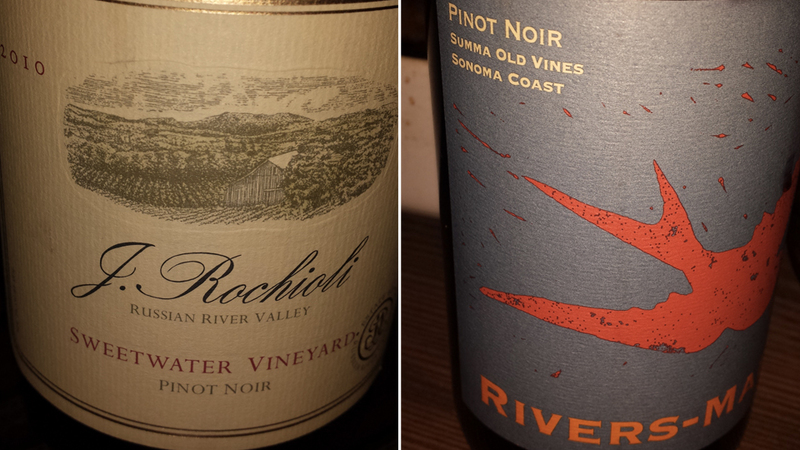 The bigger of the two Rochioli Pinot Noirs this evening. Characteristic robustness of the Rochioli wines in the 2008 vintage. Very good but not as refined as the 2008 West Block that we had last year. Fleshier with less precision, but still very pleasing. Fruit tends more toward the black cherry end of the spectrum complemented by a nice sous bois and spice character with an attractive nose. 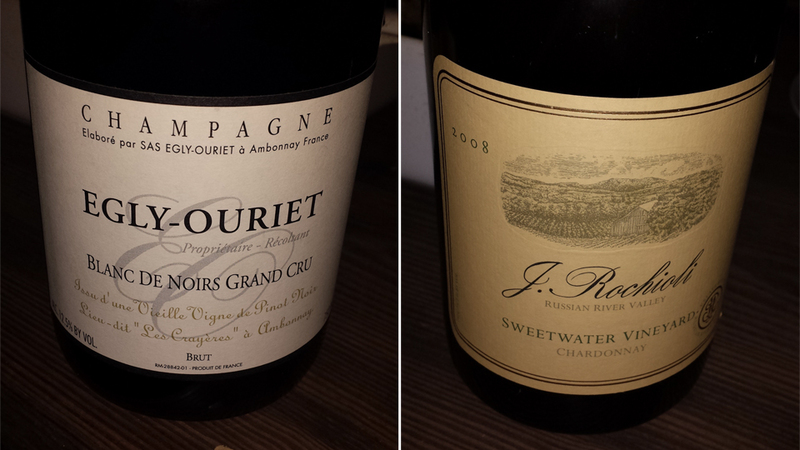 I think this would perhaps benefit from more cellar time to bring out interesting tertiary development. More elegant and balanced than the 2008 Little Hill. I definitely think that this one has some deft Fred Astaire character where we'll see some lovely dancing on the palate in a few years. Polished fruit leaning into the high-pitched Ponchatoula strawberry spectrum. Anise and forest floor accents. Quite pleasing bouquet at this stage. This is a blockbuster. Not your grandfather's Pinot Noir. Bold, extracted and long life ahead. I don't have much experience with this heralded Thomas Rivers Brown marque. This one took the longest to show its stuff over the course of the evening. Fruit more toward the blackberry end of the spectrum with a savory tartness. Cacao and toffee inflected notes with a spiciness that perhaps indicates some percentage of whole cluster. I think this old vines cuvée may be sourced from the original Summa Vineyard plantings circa 1980 near the town of Occidental, possibly using Swan clonal material. @David Zajac may be able to provide more detail as I believe he has been collecting Rivers-Marie Pinot Noir for a number of years. Paul Lato is the winemaker for this label owned by John Wagner. Very approachable and Burgundian styled. Lithe, alluring aromatics of lavender and spice. Possibly the most attractive nose of any of the Pinot Noir we enjoyed this evening. Medium weight red fruit dances on the palate with anise and sandalwood accents. An impressive showing. This came out later on in the evening. My first experience with this Washington state producer. A quaffable wine, although I am not sure I would have guessed it was Grenache if served blind. Smooth, vanilla accented fruit but somewhat lacking in texture/depth. Doesn't have the minerality I look for in a southern Rhone styled wine. Bigger than a Cȏtes-du-Rhône but not on a scale with a good Châteauneuf-du-Pape. Of course, this was very late in the evening so I could have quite a different perspective on day two. 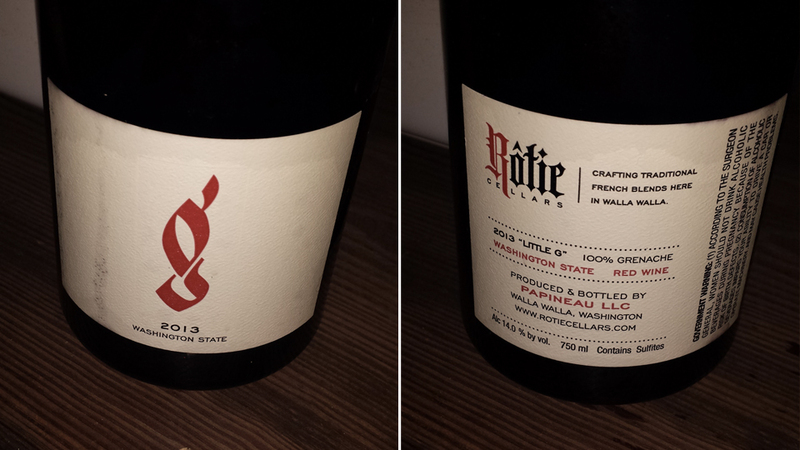 Has anyone else had experience with Rotie Cellars? The big draw from this house seems to be the Homage bottling, which is mostly Mourvèdre.